July 10, 2013.- During the first half of 2013, the Spanish wholesale electricity market has been influenced by two factors: new taxes on electricity generation entered into force and large hydroelectric and wind production due to the weather conditions of those months. The electricity demand kept its downward trend with respect to the previous half of year and to the first half of 2012. In these six months, the Spanish market reached its second historical lowest value of the monthly average of the day-ahead market, it was on April, with a value of only 18.17 €/MWh. Also during these six months, for the first time in the history of the market, the 24 hours of a given day registered a price of 0 €/MWh; it occurred twice: on March 29 and April 1st. The electricity demand in Spain during the first half of 2013 went down by 0.9% with respect to the second half of 2012 and by 3.8% with respect to the first half of 2012. According to the system operator (REE), once the data has been adjusted by working days and temperature, the month with the largest year-over-year drop on the demand was February with a decrease of 5.6%, followed by January with 3.7%. In the first quarter, the demand decreased by 4.3% with respect to the same quarter of 2012, and in the second quarter, the drop was of 3.3%. 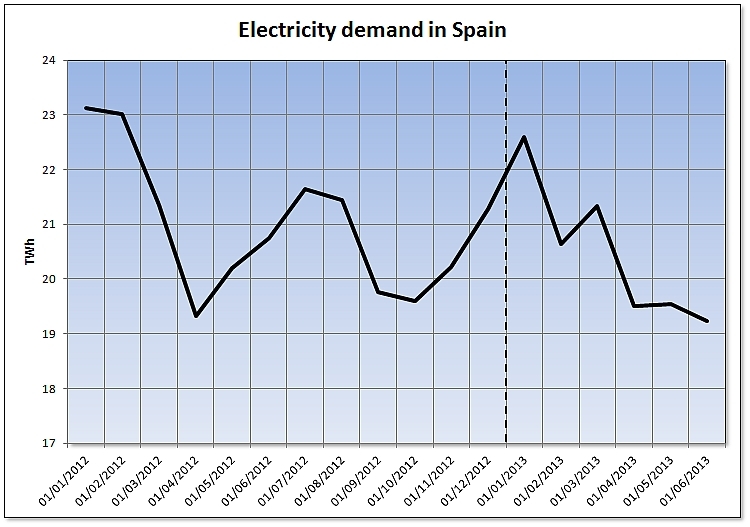 Electricity demand in Spain. Source: REE. 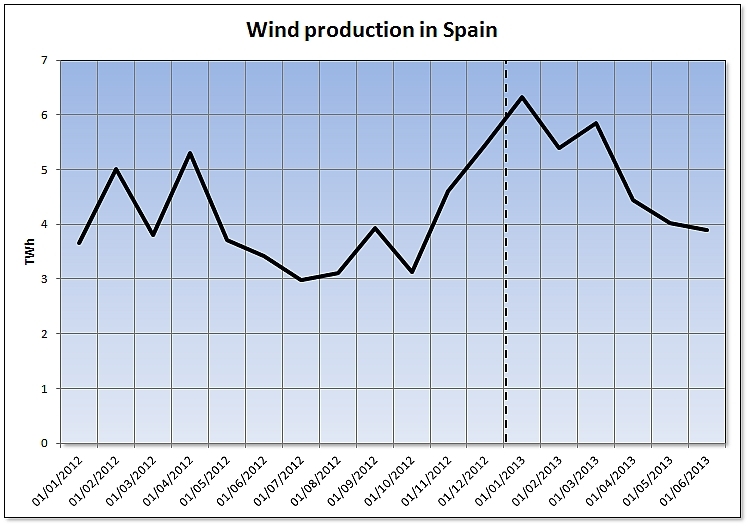 The wind production in the first half of 2013 has grown 20.2% with respect to the same half of the previous year. January was the month with the historical greatest wind production with 6332 GWh, and an increase of the production during the first quarter of 40.9% with respect to the first quarter of 2012. In the second quarter, the year-over-year variation of the wind production was -0.6%. For the hydroelectric production, the increase in the first half of the year has been 119.6% with respect to the first half of the previous year. The largest variation was in the first quarter with a year-over-year increase of 151.4%, while in the second quarter the variation was of 96.5%. The month with the largest hydroelectric production was April with 4964 GWh produced. These large increases in the hydroelectric production are due to the fact that in 2013, the production is getting closer to the production level of a rainy year, while in 2012 the production values were clearly those of a dry year. 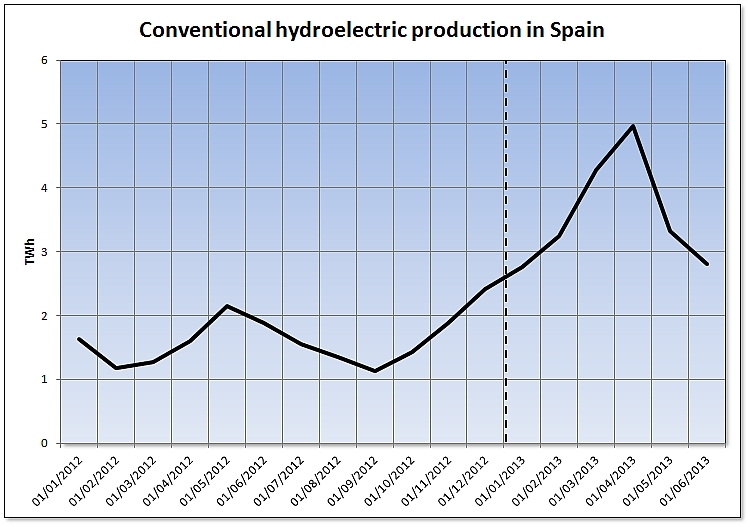 Conventional hydroelectric production in Spain. In the case of the nuclear production, the production in the first half of 2013 has been 7.0% lower than in the same period of 2012. Approximately 0.4% of the total 7.0% is the reduction of the production ordered by the system operator between March 29 and April 2nd due to the low demand during the Easter holidays. The largest year-over-year decrease was in the first quarter with 10.1% lower production, while in the second quarter the decrease was of 3.3%. The production using domestic coal in the first half of the year was 65.1% lower than in the same half of the previous year. In the first quarter, the year-over-year variation was -71.8%, and in the second quarter, -55.0%. 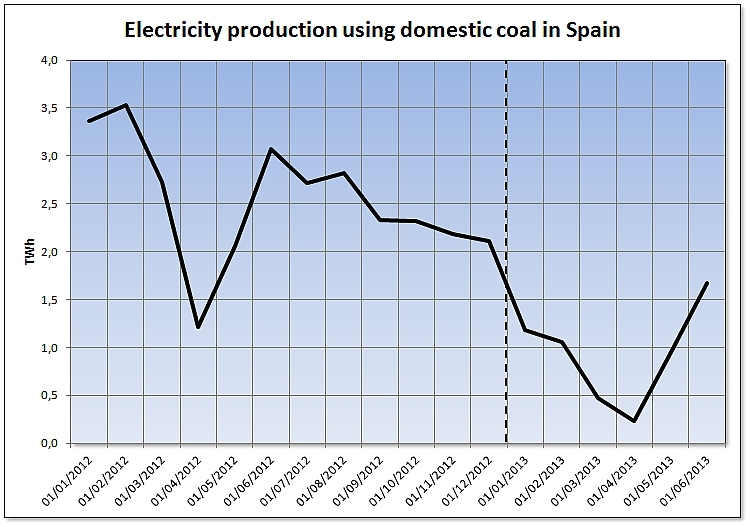 Electricity production using national coal in Spain. The production of electricity using imported coal fell by 42.2% in the first half of 2013 compared to the first half of 2012. The decrease in the production was larger in the second quarter, 53.5% with respect to the same quarter of 2012, while in the first quarter, the decrease was 31.8%. 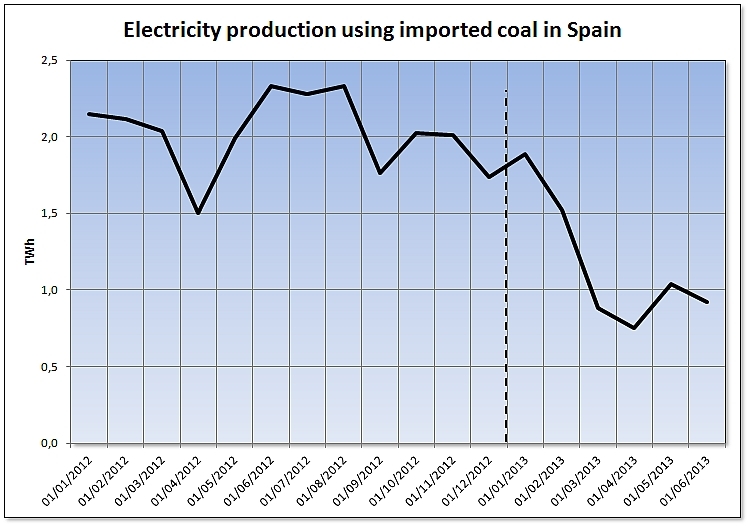 Electricity production using imported coal in Spain. 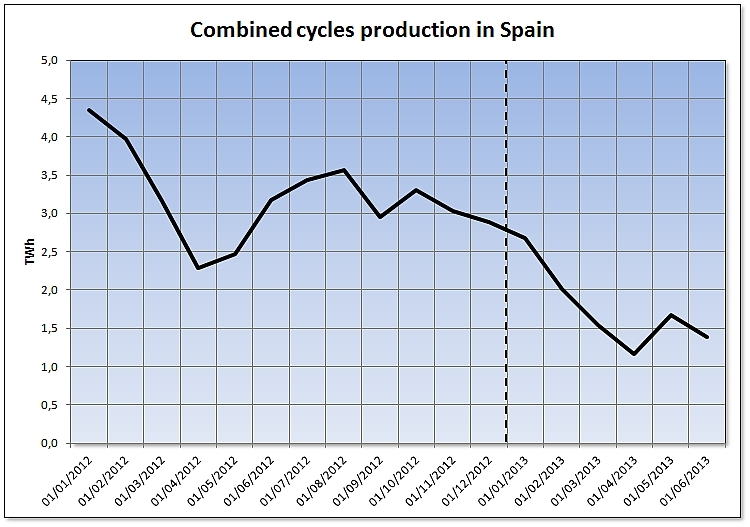 Combined cycle production in Spain. 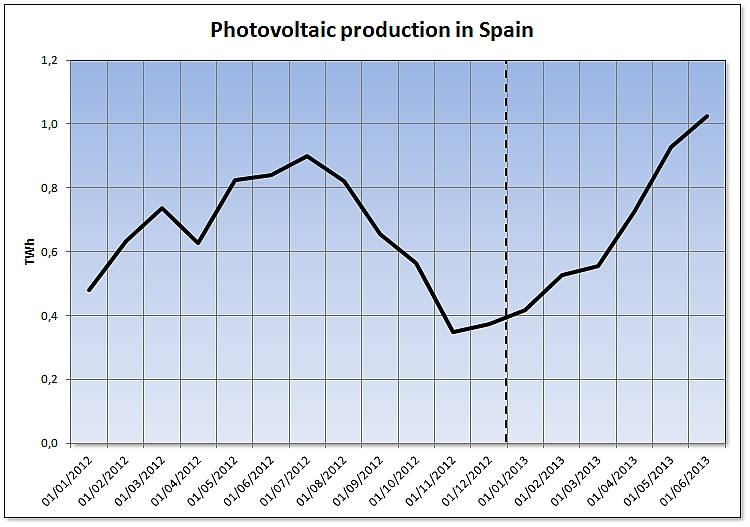 The overall photovoltaic production remained stable in the first half of 2013 with an increase of just 0.9% over the first half of 2012. However, quarterly, the behavior of the production had a greater variability, with a year-over-year decrease of 19.0% in the first quarter and a year-over-year increase of 17.0% in the second quarter. 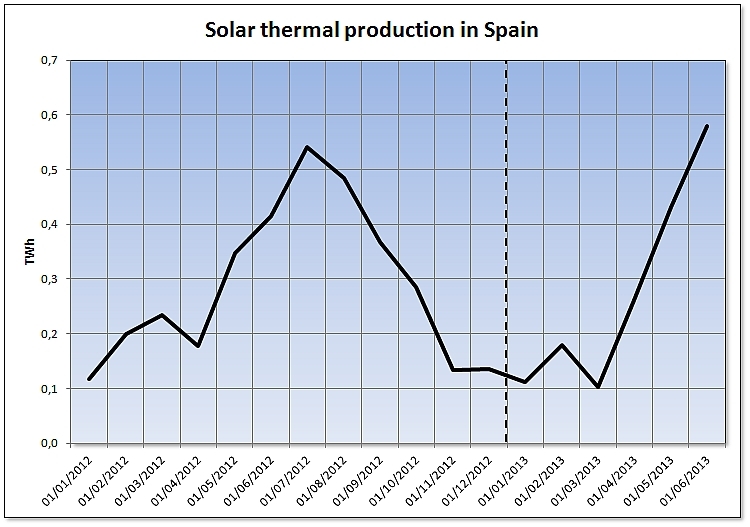 The solar thermal production had a similar behavior to the photovoltaic production. With an overall year-over-year growth of the production of 11.7% in the first half of the year, the quarterly variation moved between -28.4% year-over-year on the first quarter and 35.3% year-over-year in the second quarter. The non-renewable thermal production increased by 1.3% in the first half of 2013 over the first half of 2012. In the first quarter of 2013, the production decreased by 0.4% over the first quarter of the previous year. In the second quarter, the production was 3.1% higher than the same period of 2012. 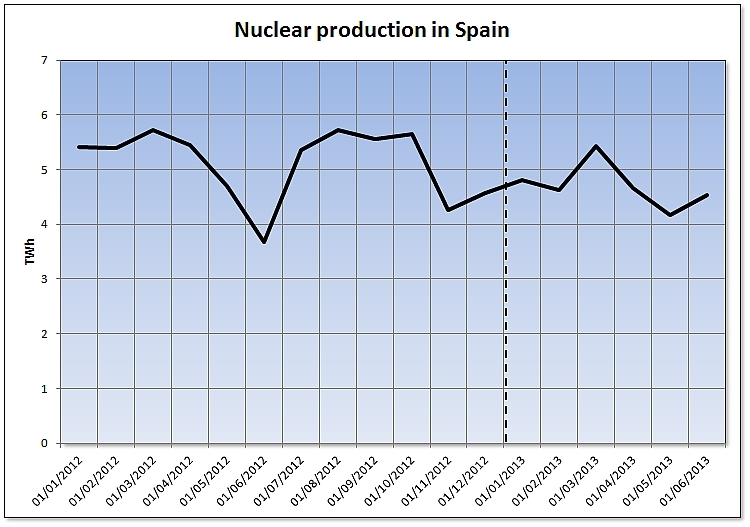 Non-renewable thermal production in Spain. 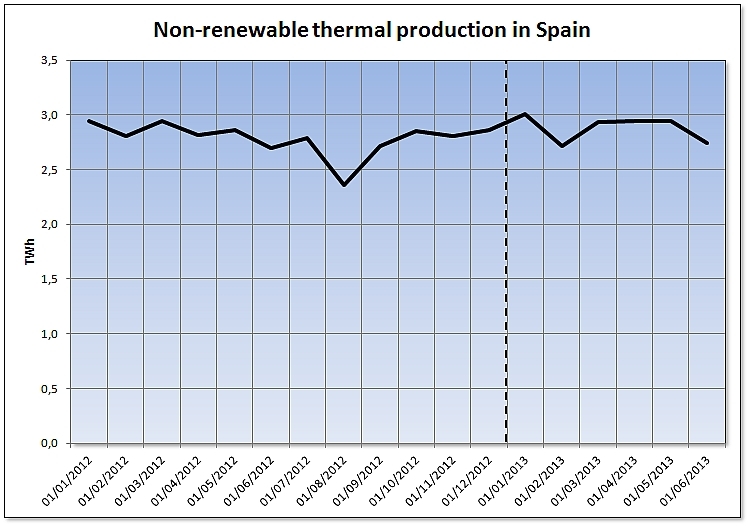 The renewable thermal production in the first half of the year increased by 13.7% compared to the first half of 2012. The most significant increase occurred in the first quarter with a year-over-year increase of the production of 19.8%. 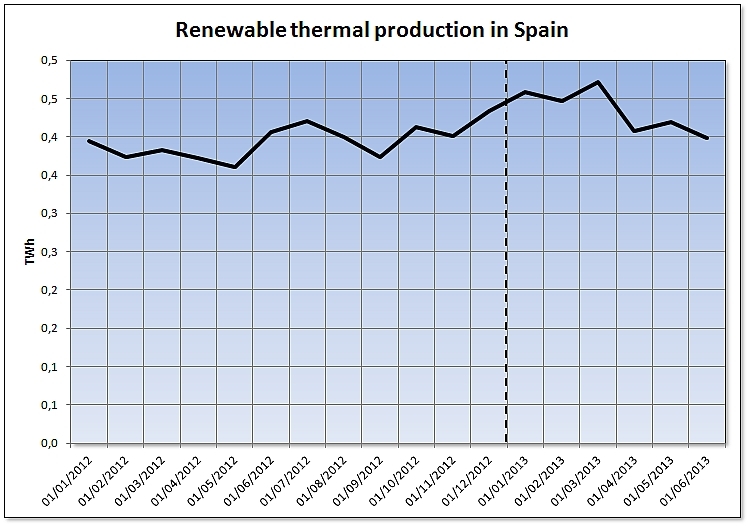 In the second quarter of 2013, the increase with respect to the second quarter of 2012 was 7.5%..
Renewable thermal production in Spain. The hydroelectric production in special regime increased significantly, 67.2%, during the first half of the year compared to the first half of last year. In the first quarter the increase reached 112.1% year-over-year, and during the second quarter it was 38.4%. 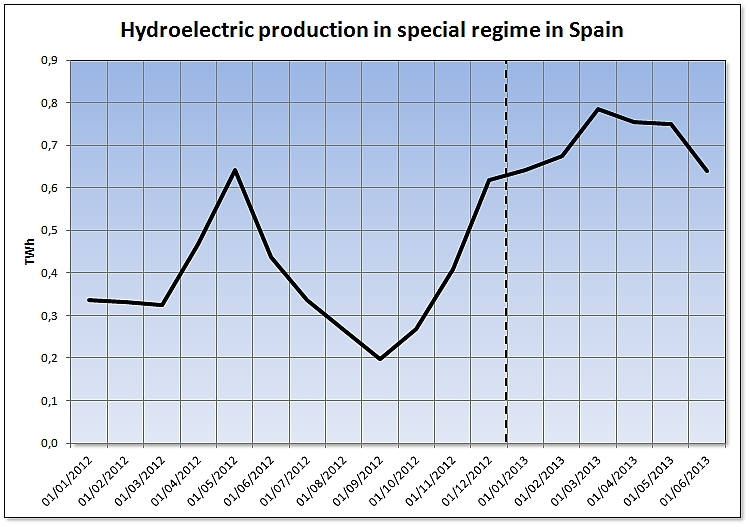 Hydroelectric production in special regimen in Spain. The price of a ton of European coal CIF ARA kept the falling pace from 2012. The average price during the first half of 2013 was 83.78 $/t, what means 6.73 $/t less than the second half of 2012. The Brent oil barrel had an average price of $107.58 during the first half of 2013. This means 2.27 $/barrel less than in the previous six months. During the first quarter, the average price stood at 112.51 $/barrel and dropped to 102.34 $/barrel average in the second quarter. The most prominent feature of the Zeebrugge gas price during the first six months of 2013 has been the high prices registered during March as a result of increased gas demand in Europe due to the low temperatures. The average price in March was 31.24 €/MWh, while the overall average of the first half of 2013 stood at 27.76 €/MWh. 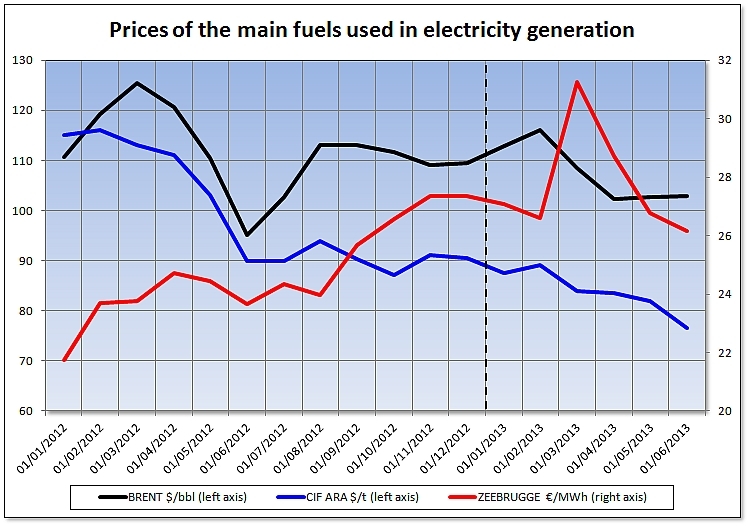 Prices of the main fuels used in electricity generation. 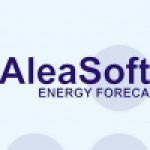 Sources: CIF ARA – EEX, BRENT – EIA, ZEEBRUGGE- NetConnect Germany. During the first half of 2013, the price of CO2 emission rights kept the downward trend started in the last quarter of 2012, except for June where the price trend changed. 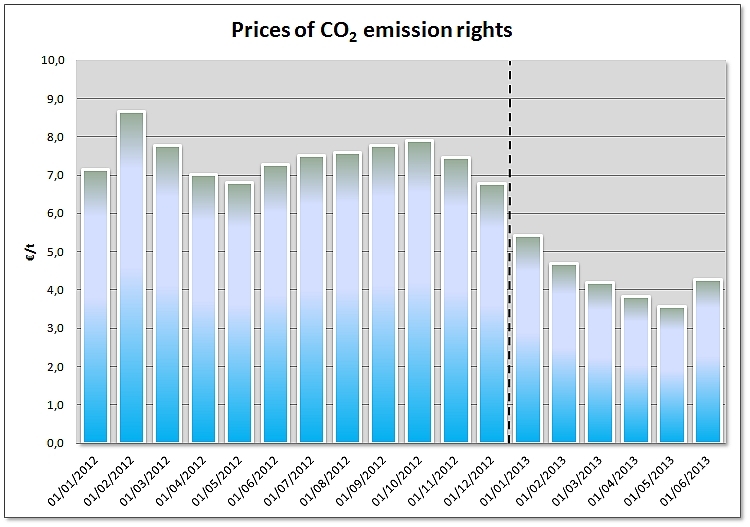 The average price of the emission rights in the first half of 2013 has been of 4.34 €/t, what means a decrease of 3.18 €/t over the previous half year. From January this year, the monthly net balance electricity trade with Portugal changed direction. During 2012, Portugal established itself as energy importer from Spain on monthly balances. In the first half of 2013 the balance between the two countries converted Spain into a net importer of electricity from Portugal with 696 GWh imported. Between January and March 2013, Spain registered an importer balance of 761 GWh. During the second quarter of 2013, the behavior reversed and placed Spain as a net exporter with a balance of 65 GWh exported to Portugal. 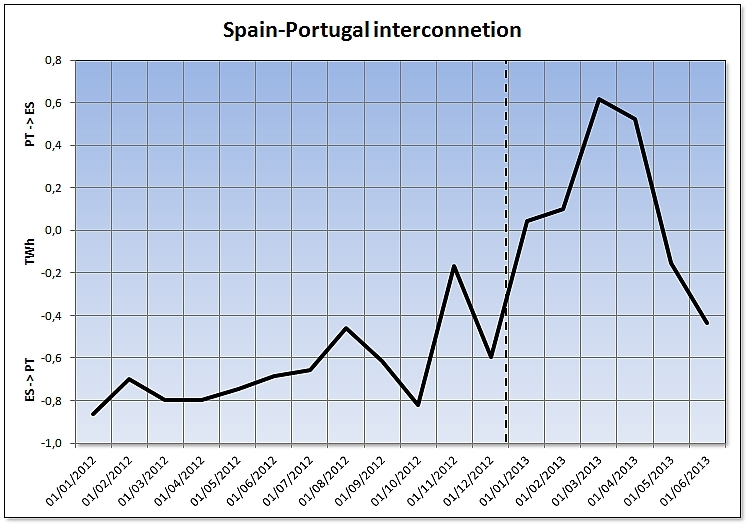 Monthly net balance of the Spain-Portugal interconnection. Positive values mean that Spain is buying electricity from Portugal and negative values mean that Spain is selling electricity to Portugal. The average price of the Spanish day-ahead market during the first half of 2013 was 37.29 €/MWh. This average value is 8.84 €/MWh lower than the previous half of year and 11.08 €/MWh lower than the first half of 2012. The first quarter of 2013 registered an average price of 40.34 €/MWh and the second quarter, 34.26 €/MWh. The monthly variation of the price of the day-ahead market was characterized by a price increase in January and February compared to December of 2012, influenced by the entry into force of the new taxes on electricity generation. In March and April there was a sharp drop that put the average price in April at only 18.27 €/MWh, the second historical lowest value of the monthly average. Between March 10 and April 14, in 39% of the hours, the market price was exactly 0 €/MWh. And on two occasions, March 29 and April 1, the price was 0 €/MWh during all the hours of the day; that was the first time it occurred in the history of the Iberian market. This price drop was due to the large hydroelectric production and the significant amount of wind production. 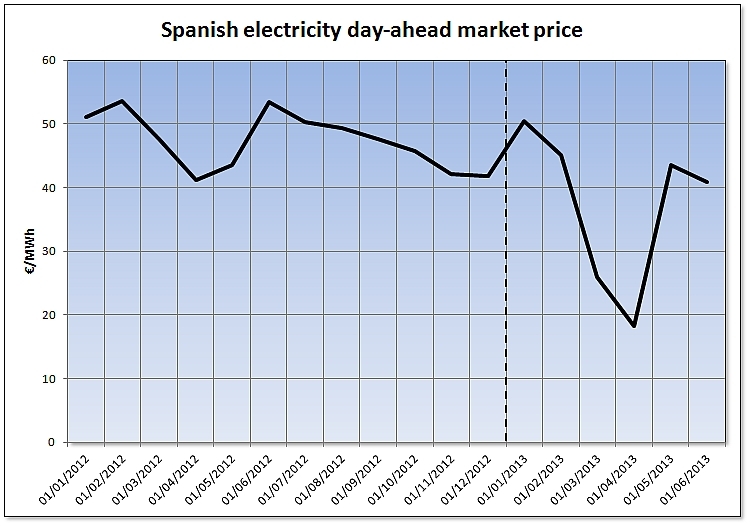 Monthly averages of the registered prices in the Spanish MIBEL day-ahead electricity market.